From Captain's Daughter to Army Mom: I have a Plan! see - Maybe, if he's in a Sugar coma, the Army will send him home! 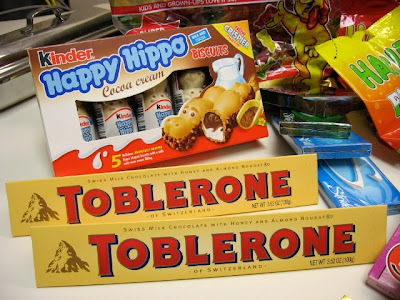 few Happy Hippos and a Toblerone should just about do it! be in our dear Rangers' hands in 10-12 days! That's quite the care package you got there. And you gathered it up pretty quickly too! I'm impressed. I'm sure he's going to love all of it. lucky boy! I'm a power-shopper through and through! I had my route well planned, and knocked it out in Less than an hour! Costco, World Market, Borders, Best Buy AND Walmart! Oh, and I even stopped for gas on the way back to the office! WOW!! 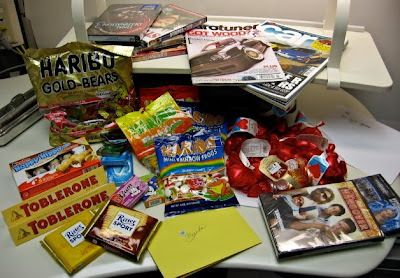 You are the BEST care package sender ever!! I know how excited you are to get a phone call from your Ranger. Nothing like it! Can you say where he is? I love the flat-rate boxes, too. We send a care package to our cadet about once a month, and we cram that thing full! He will love it Janet!! What a great package! Yes... he will be smiling! Oh, that is a great package!!! He'll be so happy to have a little bit of home away from home! I've just found your blog. LOVE IT! What a wondeful package! The hippos are absolutely the BEST! Oh, and totally random, you can fill out those customs forms online...It's a little bit easier than filling in those tiny boxes.